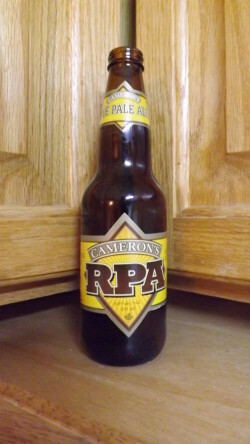 Cameron’s Rye Pale Ale has a combination of five malts and seven hop varieties. The coalition of floral British and pungent American hops is well supported by a full malt body with a massive amount of rye. hazy orange to amber colour, large, dense, stable yellowish off-white head; aroma of resiny-citrusy-biscuity-marmalade notes;taste of resiny-orange zest bitterness, biscuity-tropical fruity sweetness, marmalade bittersweetness and peppermint(?) notes; good one! Ambar, oscura. Espuma blanquecina, poco abundante. Rico aroma, bizcocho, lúpulo. En boca es muy sabrosa. Excelente base malteada, y potente contrapunto lupulado, pino, uva. Gana el lupulo con amargor notable en el post-trago, aunque también se paladea el azucar... ummm. Muy interesante. 0,341l bottle at home bought from Beer Republic. No obvious BB date. 6.6% ABV. copper / redish hazy color, medium big off-white head. smells of caramel, spices, peppery, some berry notes, some old hoppy notes. ok smell old hop notes are a bit disturbing. full body, soft carbonation, slick mouthfeel. tastes citric, earthy, peppery, some caramel, tobacco, light exotic fruits, some berry notes. finishes medium earthy bitter with notes of tobacco, berry notes and some peppery notes. rather old hoppy, but somehow apart from the old hoppy notes still quite enjoyable to drink. i think its the nice carbonation and the combination of earthy hops. overall nice one. On tap. Copper color with white head. Grain, caramel and hoppy aroma. Sweet, caramel, grain, fruity, hoppy taste. Medium body. This beer is a dark copper color with a medium thick off-white head that recedes gradually to an outer ring. Stringy lacing. Aroma of floral hops, malt and rye. Medium body with flavors of herbal hops, fruit and spicy rye malt. The finish is floral and spicy with a rye and hops aftertaste. Pretty good overall. Surprised I haven’t rated, drank many times... Great rye and floral smell beautiful spicy rye flavour coupled with tons of bitter hops, great complex aftertaste, medium body and unique malts made me come back again and again. On tap. Purs a big creamy head, with medium retention and a ggod lace. Aroma of citrics, almonds, cloves, honey, something I can’t tell, it maybe the rye, but I’ve never smelled rye :-( Medium body, crfeamy palate, strong carbonation. Taste of almonds, citrics, honey, and again that something that I really don’t know what it is. good.